A father who freed his son for two days from Swedish Social Services was released from prison last Saturday. The son, aged nine, remains in foster care following the family’s decision to homeschool before a planned emigration to India . Christer Johansson was arrested two months ago on a charge of kidnapping his own child after he, his wife Annie and his son Domenic walked out of a government ‘contact’ centre. The trouble started on 26 June, 2009, when seven-year old Domenic Johansson was seated in a commercial airliner with his parents awaiting departure on a flight to India . Though the family had received no prior warning, Swedish authorities boarded the plane just minutes before take-off, forcibly removed Domenic from his parents and placed him in foster care. Domenic is a dual citizen of Sweden and India . The family were planning to move to India where Mrs. Johansson’s family lives, and were planning to place Domenic in a school there. 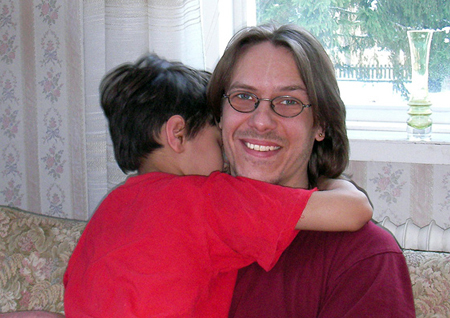 However, Swedish Social Services on the island of Gotland wanted to prevent the move to force Domenic to attend a Swedish state school instead. The family received no preliminary warning, nor had they been forbidden from leaving the country. Christian Voice understands that during an earlier court hearing, Christer Johansson explained that the reason they wanted to home-school was because they would be emigrating to India shortly. The judge allowed the family to home-school, but as Christer had disclosed their date of travel to the court, social services and the police were able to board the plane, a move which the family did not foresee. After Domenic’s abduction, there followed an agonizing 18 months during which Social Services told Mr & Mrs Johansson that they could only have an access meeting every five weeks with Domenic if they pretended to him that they did not want him at home. British Social Services impose similar conditions on parents. 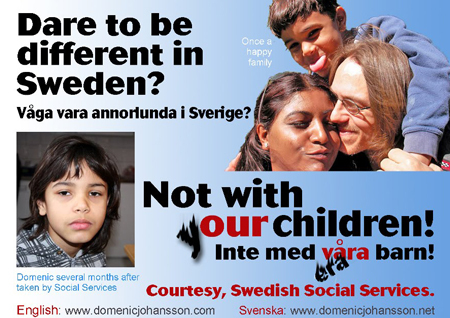 Finally, Christer Johansson decided to defy the social services by bringing Domenic home. He was able to spend two days with his family and learn the truth: that they loved him and wanted him home, that they had not rejected him and had been fighting for his freedom. That was on 22nd November last year. Two days later police descended upon the Johansson home and once again took Domenic into captivity in addition to arresting Mr. Johansson on the charge of kidnapping. While in prison Mr. Johansson was subject to psychological evaluations and deprived of adequate representation. However, the court-appointed psychologist cleared Mr. Johansson of psychological problems. WE SAY: This case displays all the arrogance of Social Services departments that we experience in Britain . The Swedish SS believe they know better that parents how a child should be educated. They believe it is better for a child to be forcibly placed ‘in care’ and made to attend a Swedish school than go to India with his parents and attend school there. PRAY: The release of Mr. Johansson is an answer to prayer that could even be termed ‘miraculous.’ Thank the Lord for that. Much prayer will continue to be needed for this precious family until their son is returned. Pray for Domenic, that the Lord would engineer circumstances to reunite him with his parents. WRITE: to the Swedish embassy on behalf of Domenic. Although we don’t know why the courts suddenly had a change of opinion, they may have released Mr. Johansson because they knew they were beginning to look bad. If so, it is crucial that we maintain the momentum and intercede for Domenic to be returned to his parents. Or CLICK HERE and click on your country for the name of the ambassador and the email address. EASY! Sign the petition to return Domenic to his parents. DONATE money through paypal. All donations go directly to the Johansson’s fight for justice. Information about how to donate can be found on the Friends of Domenic blog. This blog also provides continual updates on the situation.